With Ryanair recently announcing flights from Paphos to Amman, and Royal Jordanian Airlines already flying there from Larnaca, Jordan is now open to travelers from Cyprus on any budget. It is widely considered as a safe country with friendly people. For anybody considering a trip there, Petra, one of the new seven wonders of the world, really is a must see location and is approximately a four hour drive from Amman. Tours to Petra and of Jordan can be arranged prior to travel. For the more adventurous, you can make your own travel arrangements. Getting there is relatively easy, being a straight drive down a highway with English signposts, it is easily reachable by hire car or taxi. The taxi fare is approximately 90JD each way. Those on a lower budget can take a public bus from Amman Bus Station, a short taxi ride from the airport. JETT Bus provides Scheduled, Air-conditoned Buses leaving from Abdali in Amman at 6.30am and arriving in Petra around 10.30am. The return journey is at 5pm. Tickets cost 8.50 JD each way. You can book online on the JETT Bus website. Public minibuses to Wadi Musa leave from Mujamaaa Janobi station from 9am until 4pm and from Wadi Musa to Amman from 6am until 1pm. Tickets cost JD 5. In 1985, Petra was designated a UNESCO World Heritage Site. This city was literally built out of the desert and is believed to have been established as early as the 4th century BC as the Capital of the Nabataean kingdom. The Nabataeans were nomadic Arabs whose wealth came from trade, their kingdom was in close proximity to the major trade routes of the time and Petra became a major trading hub. In 106AD the city was annexed by the Romans. Due to a shift to sea trade routes and a major earthquake in 363AD, Petra’s importance declined. During the Byzantine era several Christian Churches were built, but by 700AD the city was all but abandoned, except for a few nomadic Bedouins who grazed goats there. Petra was “lost” until, in 1812, a Swiss explorer named Johannes Burckhardt ‘rediscovered’ the city. 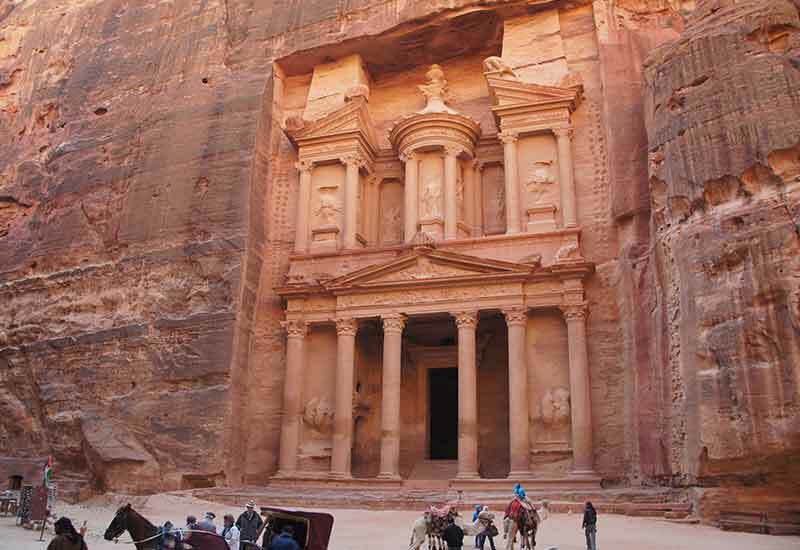 From then, Petra began to steadily attract travellers. Today the grand ruins of Petra still stand tall, and it is hardly surprising that the site is Jordan’s top tourist destination attracting 700,000 visitors from around the world in 2017. For those making the trip now, there is only one way into Petra, a walk from the visitor centre through the Siq, a narrow gorge with a winding path through the mountains. The first sighting of Petra from the Siq is the Treasury, this rock carved temple has one of the best preserved facades in Petra and is possibly the most famous image of the city. You may recognise it from (Indiana Jones and the Last Crusade). Once past the Treasury there is plenty more to see. Royal Tombs and the Roman ruins of the colonnaded street, Pillars of Hadrian Gate, the Cardo and for those with the energy to climb the 822 steps, there is the Monastery with it’s incredible facade and stunning views. The best time of year to visit Petra is between March and May or between September and November when the temperatures are between 18-25c. In the summertime the temperatures can easily reach 36C, Petra is in the desert so it can be unbearable. There are varying opinions as to how long should be spent at Petra. Ultimately it depends on the individual and how much you enjoy looking at ruins. One day is certainly not enough, for most visitors two days is the ideal time to get a good impression of Petra. A 24 hour visit gives visitors the opportunity to see the sunrise and sunset at the famous Pink City of Petra However, if you enjoy hiking there are several trails to follow in Petra and 4 or 5 days would be time well spent. There is plenty of good quality accommodation to suit all budgets in nearby Wadi Musa, a ten minute walk from Petra. 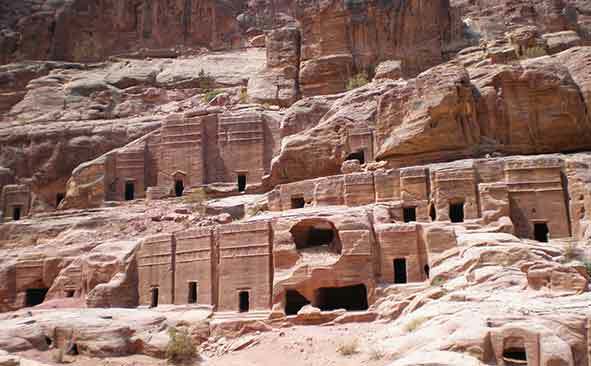 Find accommodation in and around Petra here. Visit the Ryanair website here. Visit the Jett Bus website here.